Licensed From – Illustrious Records Ltd. Licensed From – Exceptional Records Ltd. Published By – Sony Music Entertainment (UK) Ltd.
Comes free with Plastiks nr. 59 - not for resale. Issued in a card-weight sleeve. Track 1 produced by Mike Ladd for Likemadd Music. Published by Just Isn't Music. Taken from the album Beauty Party. Licensed from Ninja Tune/Zomba Distribution. Track 2 published by Jobo Music ASCAP/Ill Mental Music, BMI. Taken from the album Beat Generation. Licensed from BBE Music/Rapster Records/Pias. Track 3 published by Copyright Control. Taken from the album Higher Planes. Licensed from Kitty-Yo/Pias. Track 4 published by Scape Publishing/BMG Music Publishing Germany. Taken from the album La Nouvelle Pauvreté. Licensed from Scape/Lowlands. Track 5 published by Second Skin Music LTD & Reverb Music. Taken from the album Indian Summer. Licensed from Om Records/LC Music. Track 6 published by Jephte Guillaume Music (BMI), Mesi Music (BMI), Acroostic Music (ASCAP). Taken from the album Voyage Of Dreams. Licensed from Spiritual Life/News. Track 7 published by Warner/Chappell Music LTD/Universal Music Publishing LTD. Taken from the album Lovebox. Licensed from Jive Records/Zomba. Track 8 published by Glasgow Underground Music. Taken from the album Enter Our World. Licensed from Glasgow Underground. Track 9 published by Sony/ATV Music Publishing Ltd./Sony Music Entertainment (UK) Ltd. Taken from the album Dancehall Places. Licensed from Illustrious Records/Sony. Track 10 published by DR/Tong. Taken from the album Clean. Licensed from Solid/Labels. Track 11 published by Jackie Frost Music/BMG Songs, Inc./ASCAP + Waters of the Nazareth Publishing/EMI Blackwood Inc/ASCAP, Chase Chad Music/EMI April Music Inc/ASCAP. Licensed from !K7/Pias. Track 12 published by Universal Music LTD. Taken from the album Enemy Of The Enemy. Licensed from Labels. Track 13 published by Kebo Music (ASCAP). Original taken from the album V. Licensed from Avex Japan/Exceptional Records/Zomba Distribution. Note: track 1 miscredited as "Volvo Party"
Note: track 6 incorrectly printed as "Poukie" instead of "Pouki". 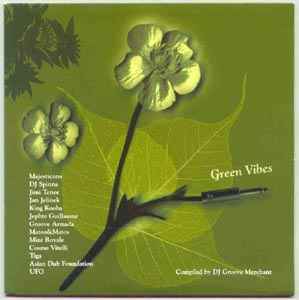 Note: track 13 (bonus track): "world-wide 'Green Vibes' exclusive - not available outside of Japan". Note: track durations not printed on release.